The following are or were members of the French Académie des beaux-arts. Wikimedia Commons has media related to Members of the Académie des beaux-arts (France). Pages in category "Members of the Académie des beaux-arts"
Alexandre Cabanel was a French painter born in Montpellier, Hérault. He painted historical and religious subjects in the academic style and he was well known as a portrait painter. 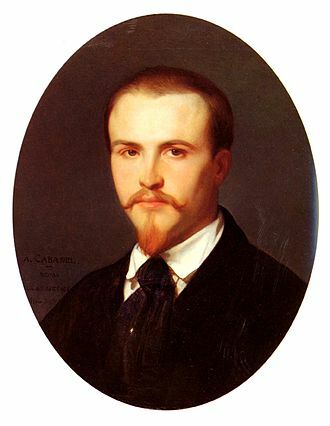 According to Diccionario Enciclopedico Salvat, Cabanel is the best representative of the Lart pompier, Cabanel entered the École des Beaux-Arts in Paris at the age of seventeen, and studied with François-Édouard Picot. He exhibited at the Paris Salon for the first time in 1844, Cabanel was elected a member of the Institute in 1863. 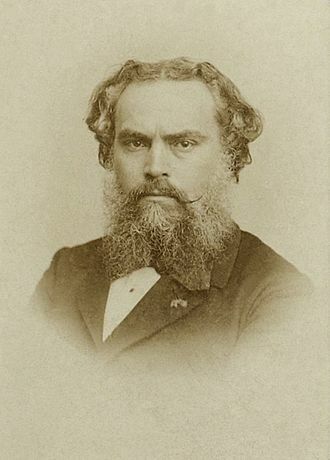 He was appointed professor at the École des Beaux-Arts in 1864 and he was closely connected to the Paris Salon, He was elected regularly to the Salon jury and his pupils could be counted by the hundred at the Salons. Through them, Cabanel did more than any other artist of his generation to form the character of belle époque French painting, Cabanel won the Grande Médaille dHonneur at the Salons of 1865,1867, and 1878. A successful academic painter, his 1863 painting The Birth of Venus is one of the best known examples of 19th-century academic painting, the picture was bought by the emperor Napoleon III, there is a smaller replica at the Metropolitan Museum of Art in New York City. Alfred Barye Le Fils or Alf Barye was a French sculptor, of the Belle Époque, pupil of his father the artist Antoine-Louis Barye. In cooperation with Émile-Coriolan Guillemin, Barye did the artwork for The Arab Warrior Knight on Horseback, included in Baryes oeuvre were animalier bronzes as well as Oriental subjects. At his fathers request, he signed his work as fils to differentiate his work from his fathers, Alfred Barye was born in Paris, France, on 21 January 1839, the son of Antoine-Louis Barye. He learned his craft of animalier sculptor under the eye of his father who was one of the original pioneers of animal sculpture in the mid-to-late 19th century. Barye which the senior Barye objected to because it created confusion as to which Barye, father or son and he specialized in the animalier school in the production of bronze sculptures. Although a fine artist in his own right, he struggled to create his own identity living in the shadow of his famous father. The vast majority of his pieces are signed A. This article concerns the painter Jean-Joseph Benjamin-Constant, for others like the European writer and politician see Benjamin Constant. Jean-Joseph Benjamin-Constant, born Jean-Joseph Constant, was a French painter and etcher best known for his Oriental subjects and portraits and he studied at the Ecole des Beaux-Arts in Toulouse, where he was a pupil of Alexandre Cabanel. A journey to Morocco in 1872 strongly influenced his artistic development. Among his noted works in this vein are Last Rebels, Justice in the Harem, Les Chérifas and his large canvas, The Entrance of Mahomet II into Constantinople, received a medal in 1876. After 1880, he changed his manner, devoting himself to mural decorations and he was distinguished as a portrait painter, especially in England, where he was a favorite of the aristocracy. His portrait Mons fils André was awarded a medal of honor at the Salon in 1896, Benjamin-Constant painted Pope Leo XIII, Queen Alexandra of the United Kingdom, Lord John Lumley-Savile, and Henri Blowitz. Victor Baltard was a French architect famed for work in Paris including designing Les Halles market and the Saint-Augustin church. He was born in Paris, son of architect Louis-Pierre Baltard and he studied at the École des Beaux-Arts, where he garnered the Prix de Rome for designing a military school in 1833. He went on to study at the French Academy in Rome, from 1849 on, he was Architect of the City of Paris. In this office, he was responsible for the restoration of churches, as well as the construction of the Catholic Saint-Augustin, in which he united the structural values of stone. His most popular achievement was, the building of Les Halles, in 1972 and 1973, these halls were torn down. A single hall was classified as a monument and moved to Nogent-sur-Marne in 1971. Architecture Construction of the courthouse in Lyon in 1847, today the seat of the Court of Appeal of Lyon, restorations Restoration of the church of Saint-Germain lAuxerrois, in collaboration with Jean-Baptiste Lassus from 1838 to 1855. Jean Boucher was a French sculptor based in Brittany. He is best known for his public memorial sculptures which communicated his liberal politics and patriotic dedication to France, Boucher was born in Cesson-Sévigné near Rennes, Brittany. After his early schooling Boucher learned the trade of a blacksmith, pierre Lenoir, professor at the regional school of Rennes, taught the rudiments of fine art to him, and soon realised his young pupils aptitude. 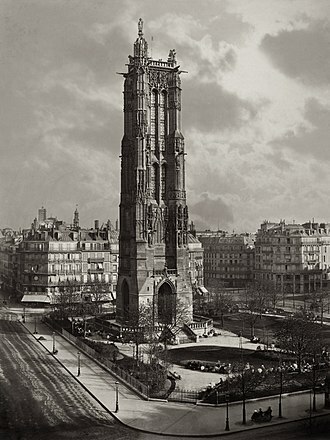 In the 1890s he worked on restorations for the cathedral of Saint Samson in Dol-de-Bretagne and he obtained a government grant to continue his studies in Paris where he met his mentors Alexandre Falguière at the Ecole des Beaux-Arts, and Henri-Michel-Antoine Chapu of the Académie Julian. Both gave him a respect for truth in sculpture, a product of the trend of Realism associated with Jules Dalou. In 1898 Boucher joined the Bleus de Bretagne, an organisation founded to promote liberal values in Brittany, Boucher was described by Armand Dayot as a Breton and freethinker. In this capacity he was commissioned to create a sculpture commemorating the skeptical thinker Ernest Renan in Renans home town of Tréguier. The sculpture, depicting Renan with the goddess Athena, was controversial, being interpreted as a challenge to Catholicism. Bouchers association with liberal and anti-clerical values led to a commission to depict the liberal hero Victor Hugo in exile on Guernsey, Hugo is depicted looking out from the island back to France, brooding over his exile, and standing on a rocky outcrop. In 1907 Boucher created a memorial to prominent Dreyfus supporter and human rights activist Ludovic Trarieux in Place Denfert-Rochereau. Another large marble in Paris is at the Place Saint-Ferdinand and it depicts Léon Serpollet in his land speed record winning steam car, surrounded by children enveloped by the steam. 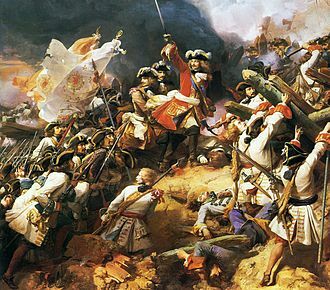 Boucher was commissioned to create a sculpture representing the union of Brittany with France. This too created controversy, particularly among Breton nationalists, who resented the union and they complained that the portrayal of Anne of Brittany was demeaning, as she was shown kneeling to the French king. 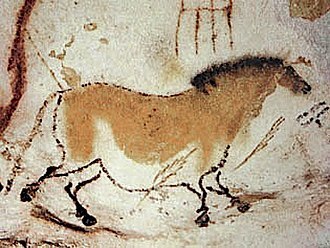 Claude Bonnefond, or Jean-Claude Bonnefond was a French painter and lithographer, noted for his portrayals of peasant life. His work was influenced by a visit to Italy. His father was a baker who died shortly after Jean-Claude was born and his mother remarried in 1797, to another baker who was an associate of her first husband. An elder brother died in military service, in 1808, at the age of twelve, he entered the École nationale supérieure des beaux-arts de Lyon, where he studied with Pierre Revoil and Alexis Grognard. In 1816, he was exempted from service for being his familys only surviving son. The following year, he had his first exhibit at the Salon, at the age of 28, he and Victor Orsel went to Paris to work in the studios of Pierre-Narcisse Guérin. 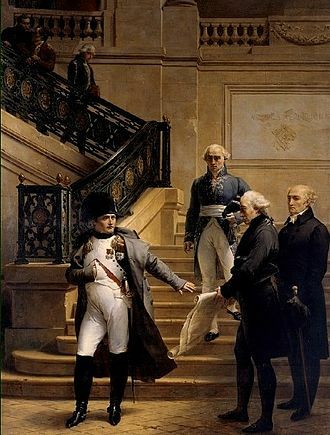 Shortly after, Guérin was named Director of the Villa Medici, in 1830, Victor Prunelle, the Mayor of Lyon, offered him the directorship of the École des Beaux-arts. He accepted, replacing Revoil, and held position for thirty years. He created a school of engraving, operated by Victor Vibert, in 1834, he was named a Knight in the Legion of Honor. Yann Arthus-Bertrand is a French photographer, journalist and environmentalist. He is especially known for his book Earth from Above. Yann Arthus-Bertrand was born in Paris on 13 March 1946 in a renowned jewellers family founded in 1803 by Claude Arthus-Bertrand and his sister Catherine is one of his closest collaborators. He has been interested in nature and wildlife from an early age, in 1963 when he was 17, he became an assistant director, an actor in movies. He played alongside actors such as Michèle Morgan in Dis-moi qui tuer by Etienne Perier. He gave up the industry in 1967 to run the Château de Saint Augustin wildlife park in Château-sur-Allier. He left the country with his wife Anne when he was 30 to live in Kenya in the Masai Mara National Reserve and he lived amongst the Maasai tribe for 3 years to study the behaviour of a lions family and took daily pictures of them during those years. He thus discovered a new passion for photography and the beauty of landscapes when observed from above in hot air balloons, every year he published a book on Roland Garros, the tennis French open. He took pictures every year at the Paris International Agricultural Show and he founded the Altitude Agency in 1991, which was the worlds first press agency and images bank specialising in aerial photography. In 1994 Arthus-Bertrand started a study on the state of the Earth sponsored by UNESCO. As part of the study, he made an inventory of the worlds most beautiful landscapes, taken from helicopters. The book from this project, Earth from Above sold over 3 million copies and was translated into 24 languages, in 2000, his Earth from Above free exhibition was set up on numerous big posters on the gates of the Jardins du Luxembourg in Paris. It travelled worldwide from Lyon to Montreal, to 110 cities and was visited by 120 million people, in 2008, Earth from Above was released on DVD. Since this program has evolved to help people and companies to reduce and offset their climate impact by funding projects on renewable energies, energy efficiency and reforestation. Since then, the organisation has been involved in several projects,6 billion Others, a video exhibition took place in early 2009 at the Grand Palais in Paris. Blondel by his friend Ingres, Rome, 1809. Aeneas rescuing his father from Troy, oil on canvas, 1803. Quadriga on the Arc de Triomphe du Carrousel, Paris, commemorating the Restoration of the Bourbons. Jean Boucher in 1921, standing in front of his model for the Monument to American Volunteers. Early sculptures on Biblical topics, Dol Cathedral. A Pardon in Kergoat (detail). Breton visited Brittany several times, believing he had (as his name implied) Breton ancestry. 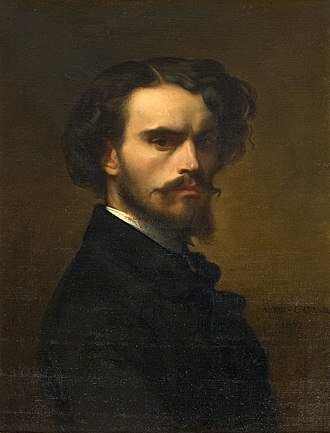 Henri Bouchard; portrait by Carolus-Duran.